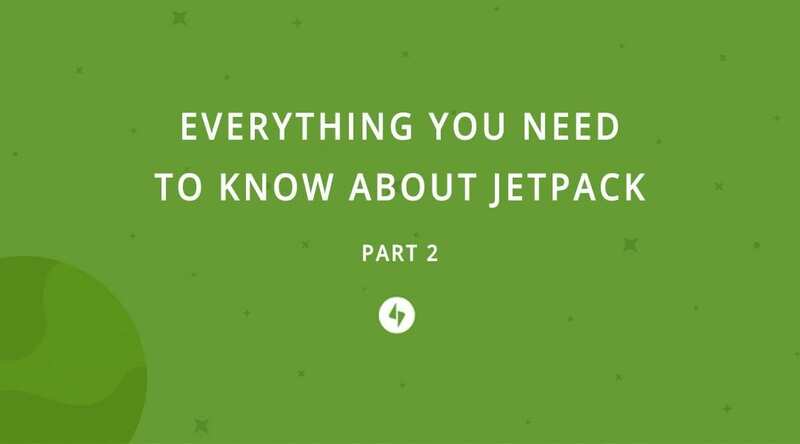 We recently published a blog post that discussed the Jetpack plugin by Automattic in depth. In the post, we covered a brief overview of the plugin and it’s core functions, as well as whether Jetpacks size (just under 6 GB) would ‘bloat’ your website and negatively affect site speed. Read the full post here. 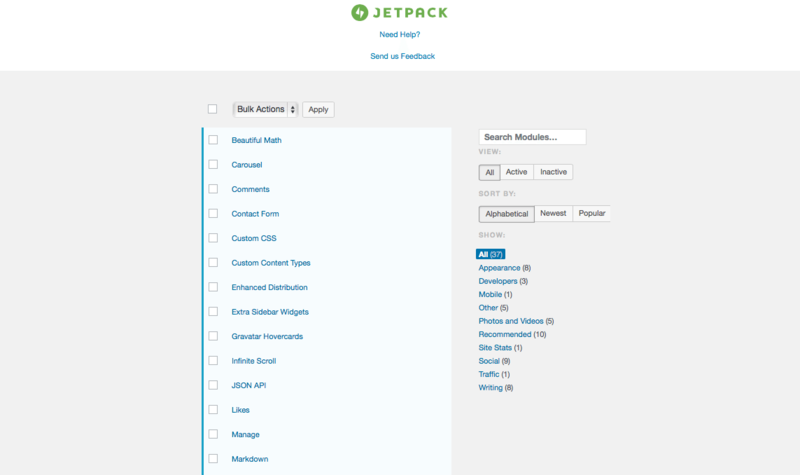 Following up on the previous post, we’ve listed each and every one of Jetpack’s modules below. Here, you’ll find an overview of the modules functions as well as a brief description of configuration settings. To Activate one of the modules, navigate to Plugins > Installed Plugins and located the Jetpack plugin details. Click on the Settings button. This will open up the Jetpack Settings console where modules can be activated or deactivated using the check-box interface. By clicking on the hyperlinked name of the module will open up a new tab that explains the module in-depth (via the Jetpack support page). When hovering over the module name, an easy Deactivate option will appear, as well as a Configure option for select modules. The Configure option will direct you to the exact area of your WordPress console for user input required settings. As we at Aspen Grove Studios are 100% Divi loyals, we’ve tried to add a few points to assist other Divi users in making a decision between using Jetpack or not. When applicable, we have noted alternative Divi-specific solutions. At present, the Jetpack version 4.3.1 includes the following modules listed below – each of which can either be activated or deactivated depending on the needs requirement of your or your client’s website. Beautiful Math allows you to use LaTeX markup text in both posts and pages. Here, you’re able to insert and display complicated mathematical equations, formulas and symbols/characters within your text. With Carousel, you’re able to display your Media Library images in a full-page slideshow. To activate Carousel, you’ll need to configure a few aspects via the Settings > Media console once Jetpack is activated. Here, you’re able to set whether you’d like to include “photo metadata” which will display information detailing your camera type, aperture, focal length and shutter speed. If you’re using Divi, you could easily insert an Image Gallery module within a post or page and set the display option to Slideshow (not grid). This will display the image gallery in a similar fashion (as a Lightbox gallery, also viewing as full-screen). If you’d like to include camera information, you could simply add this to the captions of the image/s. Jetpack Comments replaces the default comment form with a new form that integrates social media (Facebook, Twitter, Google+) and WordPress.com accounts. To activate Comments, you’ll need to configure a few aspects via the Settings > Discussion console once Jetpack is activated. When using the default WYSIWYG editor for pages and posts, a new box labeled ‘Contact Form’ will appear. Through Divi, adding a contact form is as simple as adding the correct module and setting specifications to match your form’s requirements, however, the Jetpack contact form ships with a few more dimensions for more intricate aspects including checkboxes, radio buttons, and drop-down selection items. Once complete, the Jetpack Contact Form can be styled via CSS to mimic the same style and aesthetic of your web build. The only hindrance here is that a Jetpack contact form can only be used once per page, whereas, with the Divi builder, numerous forms could be used if need be. Customizing the core theme files of a WordPress website should be avoided at all costs. Jetpack’s Custom CSS feature allows site devs to edit the theme’s CSS without the risk of theme updates overwriting changes and without creating a child theme. This is quite a nifty feature, but at the same time, creating and running a child theme has a number of additional benefits, and really isn’t too hard to set up (such as using an IDE with color codes for easy identification of code blocks). For an in-depth article discussing the how to’s of child themes (including creating and running one), read this blog post . If you’re using Jetpack and would like to customize your site’s aesthetic and edit your CSS, navigate to Appearance > Edit CSS (stay away from the Editor console). Sometimes, a web build requires a bit of a specialized content form that doesn’t exactly fit into the realms of a post or a page. With this, a Custom Post Type is required, and Jetpack makes including these CPTs really easy. To activate the Custom Posts Types, navigate to Settings > Writing, scroll down until you see “Your Custom Content Types”, select Portfolio Projects and/or Testimonies and set the specifications (display x amount of) to suit your requirements. Once you’ve clicked Save Changes, two new Dashboard items (Projects and Testimonials) will appear and you’re all set to start filling in the relevant content. Jetpack also allows you to include Simple Food Menus and Comics Post Type (for publishing webcomics) as CPTs to your WordPress website. Both of these CPTs use various shortcodes and include downloadable material, so be sure to suss out the Custom Content Types configuration documentation for more information. As Divi includes a Portfolio CPT within its theme, and testimonial features are relatively simple to set up with either Divi Library Layout Packs, this might be a bit of overkill for your site. 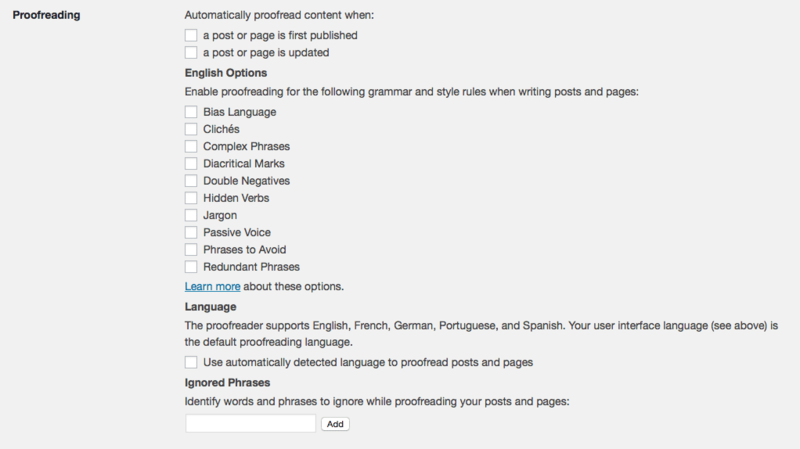 With this feature, your or your client’s public blog’s content will be automatically included within the WordPress.com firehose. This is really cool if your or your client’s focus is on content creation and distribution, as linking to the WordPress Firehose offers more exposure to content posts and comments by notifying third-party services when a new post is published. In the event that a firehose user decides to display your content, they are required to link back to your original post, which is great for link building and SEO health. After installing Jetpack and activating the Extra Sidebar Widget, a collection of new widgets will appear within your Appearance > Widgets console. This feature includes an additional 13 widgets that can be added to either the sidebar or footer area/s and include features such as Twitter timeline feeds, galleries, RSS links and Goodreads profiles. A Gravatar is basically your universal web profile, and enabling Gravatar Hovercards will ensure that a pop-up (complete with an image, description and relevant web and social links) will surface when you hover over a user’s Gravatar when, for example, they comment on a blog post. To activate the Gravatar Hovercards, navigate to Settings > Discussion, scroll down to the Avatar section and select the Gravatar Hovercards check box. As with Pinterest and certain news channel streams, infinite scroll – in certain situations – is a great method of displaying content. If not a perfect fit for the form of content, infinite scroll could create frustration for a user, especially if page load time is a contributing factor. Nevertheless, if you’d like to enable an endless stream of posts for your blog – and your chosen theme doesn’t support this natively – simply enable it with Jetpack. As a note, your user will never reach your footer with infinite scroll, so consider including a sticky menu for your website to troubleshoot any site navigation issues that may arise. This feature is for developers and it allows Jetpack to seamlessly and securely integrate applications and services with a WordPress website. Quite simply, Jetpack Likes allows users with a WordPress.com account to ‘Like’ your website’s post or page. To activate Jetpack Likes, navigate to Settings > Sharing and set the ‘WordPress.com Likes’ option to ‘all posts’. This feature will only work if the user is actively logged into their WordPress.com account. Once activated, a series of tiny images (user Gravatars) will appear below your post. If for example, you have a post that you don’t necessarily want users to Like, you can simply deselect the ‘Show Likes’ checkbox while creating a new post in the Likes and Shares section of the editor. This feature is really helpful if you’re a developer or admin that is handling a number of WordPress websites all at once. With Jetpack Manage, you’re able to link and manage both self-hosted and WordPress.com websites from one central Dashboard. As well as managing theme and plugin updates without having to log into each individual website, if you’re a content writer or manager and are handling multiple blogs or sites, Jetpack Manage will allow you to post to a single blog while viewing each website from a central location. This is great if you’re using the default WordPress WYSIWYG interface, but won’t work if you’re intending on using the Divi Builder to create a post. This allows you to use Markdown syntax while writing content for either a page or post. By enabling Markdown in the Jetpack settings configuration, you’re able to write text at rapid speed and use a series of syntax for text formatting without ever having to reach for a mouse or trackpad. The Markdown feature doesn’t work all too well while using the Visual Editor, so stick to the WordPress default Text Editor when writing. For a list of the syntax needed to create Markdown references, read this article. If your WordPress website is not already responsive, the Jetpack Mobile feature will easily enable a device-friendly version of your theme that will load – instead of your chosen theme – when your website is viewed from a tablet or smartphone. This is a great feature if you’re unable to create a responsive version of your website from the ground up. With Monitor enabled, Jetpack will check your website’s visibility every five minutes and if something looks odd on the server side and the website is not displaying, you’ll receive an email notification (to the Jetpack connected email account). This ensures that you’re pretty much the first to know if your site – or an associated client’s site – experiences any vulnerability. From the Jetpack settings console, set the Monitor configuration to Active. Jetpack Notifications enables a little speech bubble icon within your Admin toolbar that opens a drop-down list displaying any new likes, comments etc. that occur on your site. Jetpack Notifications extends further to devices: if you’re using Firefox or Chrome, you can enable notifications directly on your Dashboard, and too, if you have the WordPress app installed on your smartphone, the notifications will arrive directly on your device. Through Omnisearch, you’re able to search through your entire website database (a keyword of sorts from a blog post or page) from the convenience of your WordPress dashboard. Jetpack Photon saves on images load time, which will decrease the overall page load time of your website. Photon creates a copy of the images uploaded to the Media Library, and will store a copy of the image in the WordPress Repository, optimize and automatically cache it. Once your website is accessed, images will load from the WordPress CDN (content delivery network), not your server, thus relieving quite a bit of stress from your database. This is particularly useful if you or your client are constantly image based content. This feature allows you to publish a blog post by sending a mail to a specified email address. By following a few configuration steps, you’re able to generate a specialized email address that links to your WordPress website, and, once active, can be mailed a publish-ready post. Here, the subject line will become the post title and the body of the mail will become the post content. For added convenience, any image attachments will be included in the body of the post (a single image attachment will display inline while multiple uploaded images will automatically display as a gallery). There are a series of settings for Posts by Email to include tags, categories, polls etc., so be sure to read through the Jetpack Posts by Email documentation thoroughly. 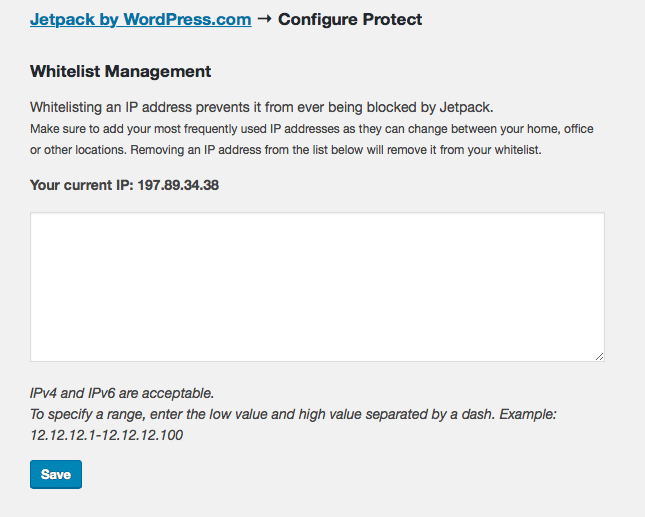 The Jetpack Protect feature will block any malicious login attempts to your site. By simply connecting your social media accounts to Jetpack, you’ll be able to automatically share a post via relevant social channels as it publishes on your site. Once configured and your social accounts are connected (navigate to Settings > Sharing), the Publicize section will appear in the Publish console of the screen while you’re writing a post. When using Publicize, there are a few considerations to keep in mind (especially regarding imagery), so read through the provided documentation thoroughly. Great for keeping readers on your site, the Jetpack Related Posts feature will display a series of similar blog posts below the final closing text of a blog post. To find the most relevant related post, Jetpack makes use of Automattic’s Elasticsearch to scan and analyze the similarity between your existing posts and will display related posts based on tags and categories (another reason why it’s so important to put in the elbow grease with these WP features). To activate Related Posts, navigate to the Settings > Reading > Related Posts console to configure. Here, you’re able to keep the related posts as text-only or include an image for an extra attractive visual element. 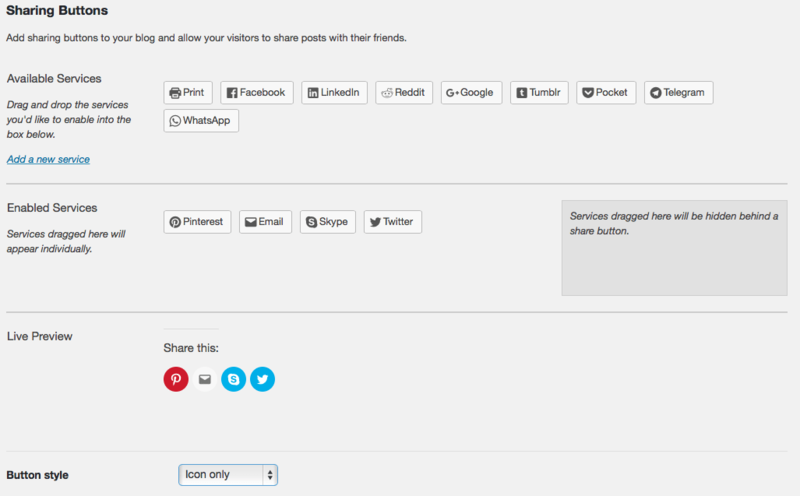 This feature allows you to display social sharing buttons on either posts or pages. Navigate to Settings > Sharing and simply drag and drop the relevant share services from the Available to the Enabled section. Within the Button Style drop-down, you’re able to decide how you’d like the share buttons to display, and you’ll be able to see these in action via a Live Preview console. With Jetpack Shortcode Embeds, you can easily embed media content from across the internet (i.e. YouTube or Vimeo videos, Twitter tweets, Soundcloud songs, Slideshare slideshows etc.) onto your WordPress website. Shortcode embed is compatible with an extensive list of media types, each of which includes its own protocols and processes for inclusion, so follow the correct instructions (links offered within the Jetpack settings console) when executing. By enabling Single Sign On from the Jetpack settings console, your readers will be able to login to your website using the same account they use for WordPress.com, making it easier for a user to use an existing account (as opposed to creating a new one) for comments, subscriptions and follows. Through Jetpack Site Stats, you’re able to view basic website traffic statistics for your website right from within your Dashboard. Site Stats merely offers a brief look into your website’s activity, with additional data available on WordPress.com, so it is best practice to team this with a more in-depth data reporting tool. For a guide to setting up Google Analytics read this blog post. Quite simply, as you’re typing away in your posts or page editors, Jetpack will make sure to check your spelling and grammar using After the Deadline proofreading technology. There are a few configuration settings to go through so navigate to Users > Your Profile and set your language preferences. As soon as you enable the Jetpack Sitemaps module, Jetpack will automatically generate two XML sitemaps of your website: one which lists all of your pages and posts, and a second News sitemap that is optimized specifically for Google News. These sitemaps then become available to all of the relevant search engines (Google, Yahoo!, Bing, Ask.com, and others) that will crawl or index your site during search. 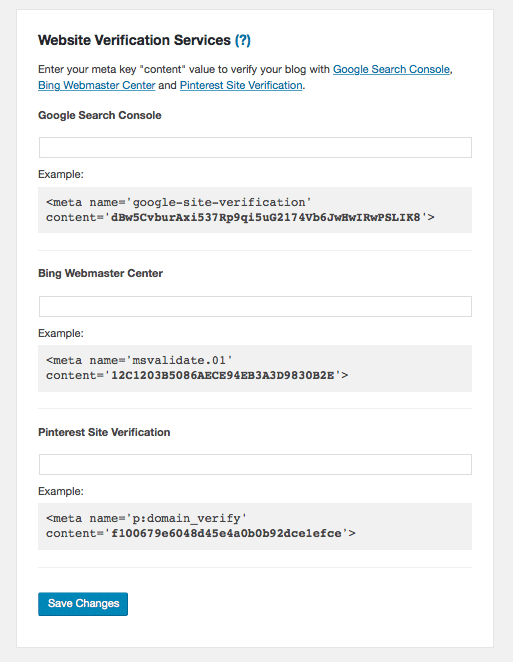 This feature makes verifying your site ownership with Google, Bing, and Pinterest really simple. Sometimes, verifying these channels can lead to a bit of a run around process and too, can be quite confusing if you’re not too familiar with code and inserting authentication tags into the theme files. To verify your accounts, simply enter your generated meta key “content” values into the Tools > Available Tools section. Jetpack’s subscription module allows you to set up easy subscribe options for your readers. 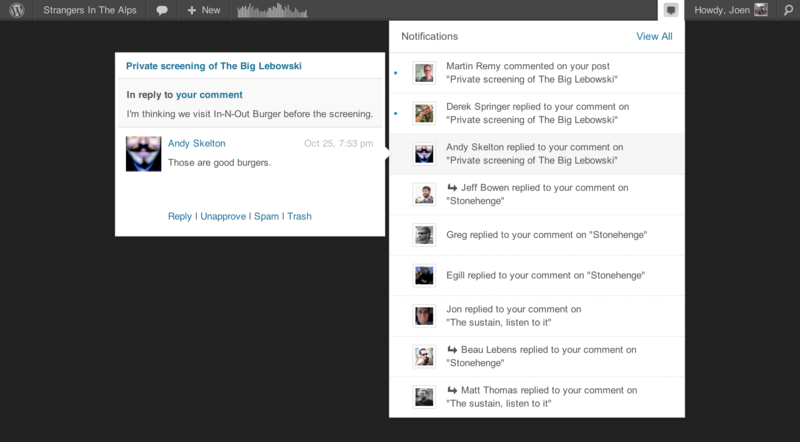 Here, your readers will be able to receive notifications regarding your latest posts and/or comments. This is a great means for converting site visitors into repeat readers. With Jetpack Subscriptions, a simple check box will appear below the comments section of a post, offering readers the opportunity to either notify them of new posts or follow-up comments via mail. Jetpack Subscriptions can also be added to the sidebar by simply enabling the widget and modifying the call to action text as desired. If you’re using Divi by Elegant Themes in conjunction with Bloom (the email sign up plugin, also by Elegant Themes), it’s really simple to add an opt-in module just about anywhere within a web build. This feature allows you to create attractive image galleries that display a series of images in interesting layouts. Three default layouts are available – Tiles, Squares and Circles – and each image displays a caption on hover. This is a great method for displaying a series of images in an eye-catching way. To enable Jetpack Tiled Galleries, navigate to Settings > Media and check the box to activate the feature. Then, when you’re busy with a post, select the relevant style via the Image Gallery Settings. If you’re using Divi By Elegant Themes, a similar image display style could easily be achieved (with even further layout varieties) by using a combination of layouts from the Speciality Sections and placing in various image modules when required. Here, simply playing around with gutter and padding dimensions can aid in achieving a truly stunning image display layout. Available only through Jetpack Premium or to a WordPress.com premium account, VideoPress is a pretty nifty feature that will allow you to upload video files from your computer and host them via WordPress.com for display on your self-hosted WordPress site. This is great if you or your client make use of video content pieces and don’t necessarily want to upload them to social platforms such as Vimeo or YouTube. Again, if you’re using Divi by Elegant Themes, adding the Video module into either a page or post will allow you to upload a file via your computer. When enabled via the Jetpack Settings, Jetpack Shortlinks will generate a shortened URL (wp.me) for either a post or page. These shortened URLs will allow for more text space to write on social media posts and too, keep your posts looking neat and tidy by eliminating long distracting links. 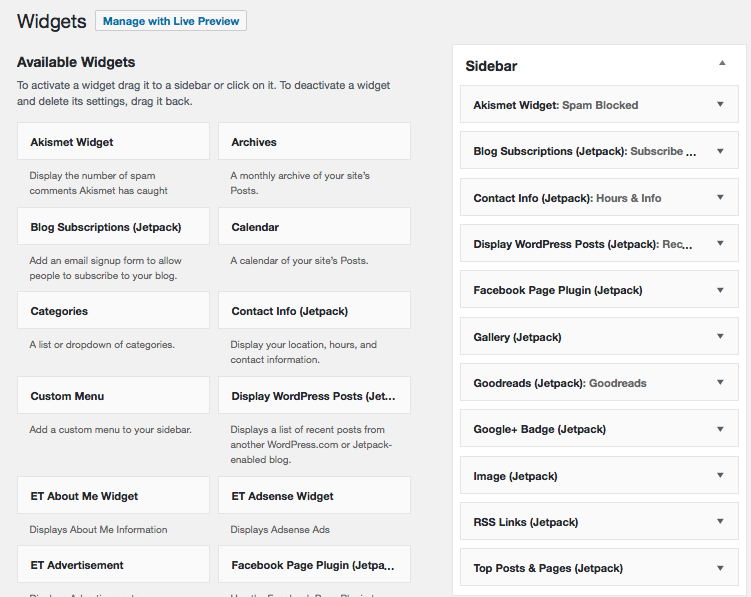 Through Jetpack Widget Visibility, you’re able to set which widgets appear on specific pages. Here, you’re able to set widgets to either Hide or Show based on page or category specifications. Only available as a paid premium extension, VaultPress runs automatic backups of your website and also offers a backup storage service. As Jetpack pulls functionality and usage from the WordPress.com resources and servers, there’ll need to be some linkage between your self-hosted website and the WordPress.com cloud, so to begin using Jetpack, you’ll need to sign up for an account via WordPress.com. Once you’ve got your WordPress.com account in the bag, return to your WordPress dashboard, navigate to Plugins > Add New and search for Jetpack. As Jetpack is created by the WordPress.com team, and also, it’s a really popular plugin, it will more than likely be at the top of the list for plugin download options. Click install, and once the installation is complete, Activate Jetpack. We really hope that you enjoyed reading this blog post and that the content above has helped you make a decision toward using Jetpack. If you have any comments or queries below please feel free to share them below! Thanks for this post! I had forgotten Jetpack did some of these things! Thank you for thsee two posts. 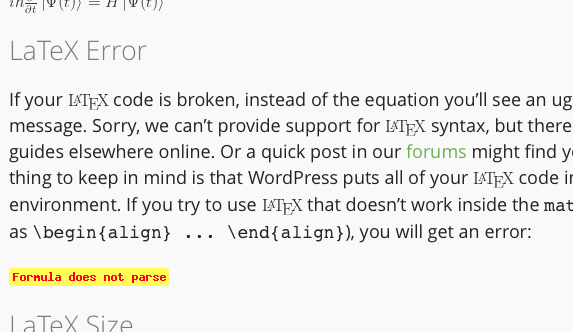 I am a new WordPress user and this is very helpful. You’re very welcome Gene, glad we could help! How can I remove the divi shortcodes? As far as I know there is no direct way around this because shortcodes are not currently supported by Jetpack. The best current workaround would be to add a custom excerpt to your post or not enable the Divi Builder (use the standard post editor). I really want to use the share thing, but jetpack puts it in weird places. When I don’t use the divi builder it shows up nicely, but I usually do us it, and then it goes to the far left with no margin and looks terrible! Could you please give us some tips about how to make that work? If you’re already using Divi, don’t forget about the Monarch plugin for social sharing by ET: https://www.elegantthemes.com/plugins/monarch/ This is an easy, works with Divi solution. Alternatively, I found a couple resources that discuss the sharing layout problem with Jetpack and Divi. This guy says to build a global library item within Divi for social sharing versus using the Jetpack version: https://youtu.be/cbgDU1OUaQw.